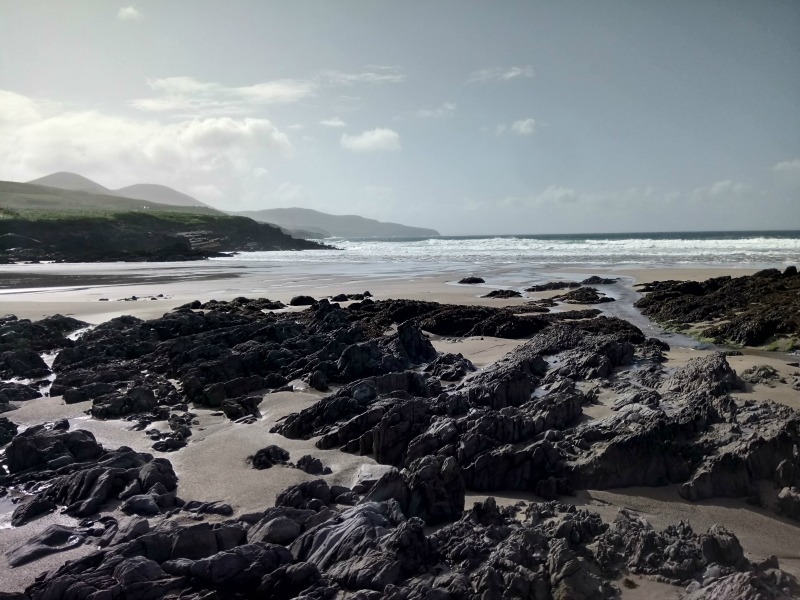 When we planned our road trip of Southern Ireland one of the first things penciled in was to visit and drive around the famous Ring of Kerry. Accommodation booked. Flights organised. Car hired. All sorted. What could possibly go wrong? Well we failed to take into consideration the Irish weather didn’t we? Classic mistake. Like all visitors to the Emerald Isle we were aware that Ireland copped some serious weather from the Atlantic but I have to admit that we really had no idea just how much rain came this way. The locals are used to it and all readily accept that it rains often but after being here for a few days we realised that it rains A LOT. To make matters even worse there was a severe storm warning on the day we had scheduled for our Ring of Kerry drive. Storm Aileen was on her way with 130mph winds and a shedload of guess what, rain! Our new Airbnb in Beaufort just outside Killarney was lovely though and our host, Mary, went out of her way to make us feel at home. Her beautiful cottage with incredible views of the Gap of Dunloe and Carrauntoohil was perfect. 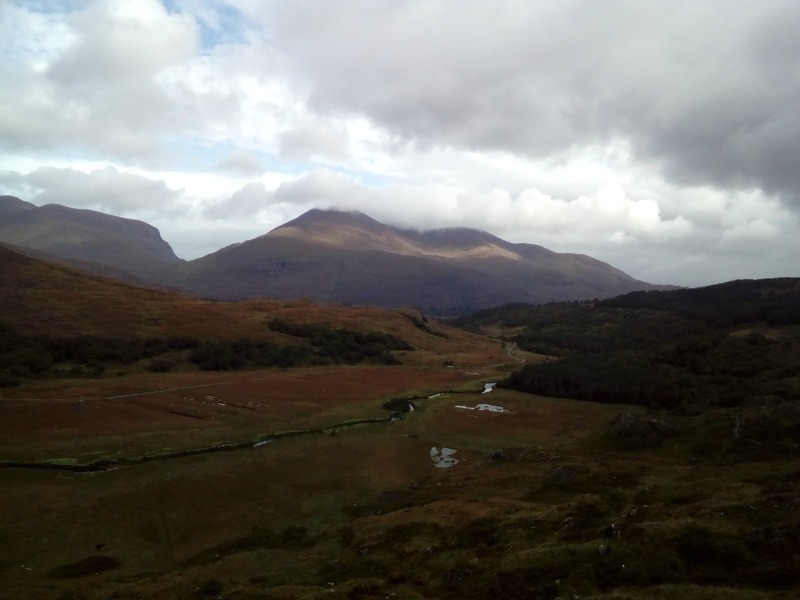 Lots of leaflets and maps and great advice on where to visit was most welcome but after hearing the severe weather warnings we decided to postpone our Ring of Kerry drive for a day and stay local just in case. 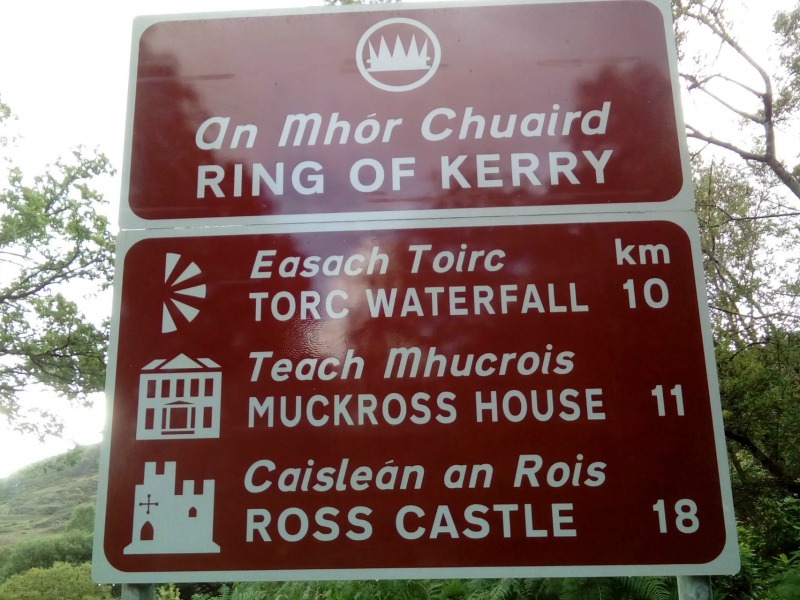 What is the Ring of Kerry? 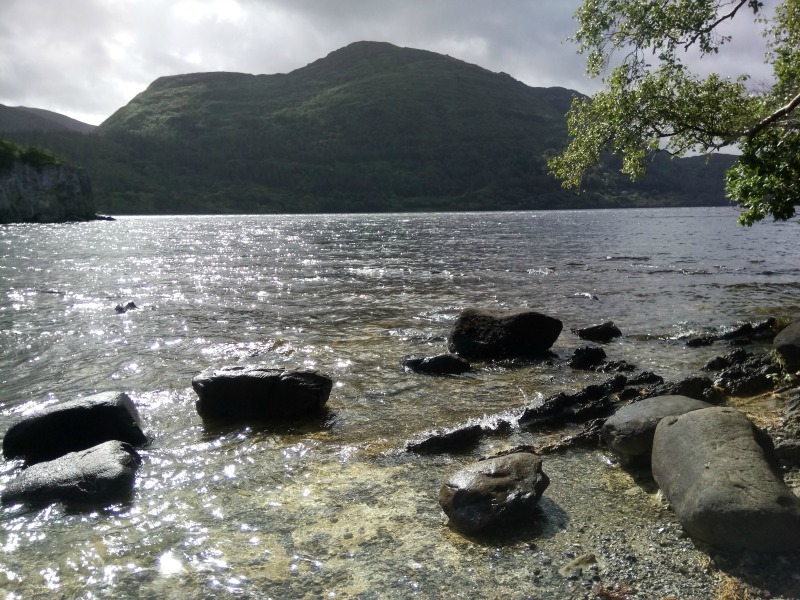 It is a 179 kilometre circular drive around Country Kerry to the west of Killarney. 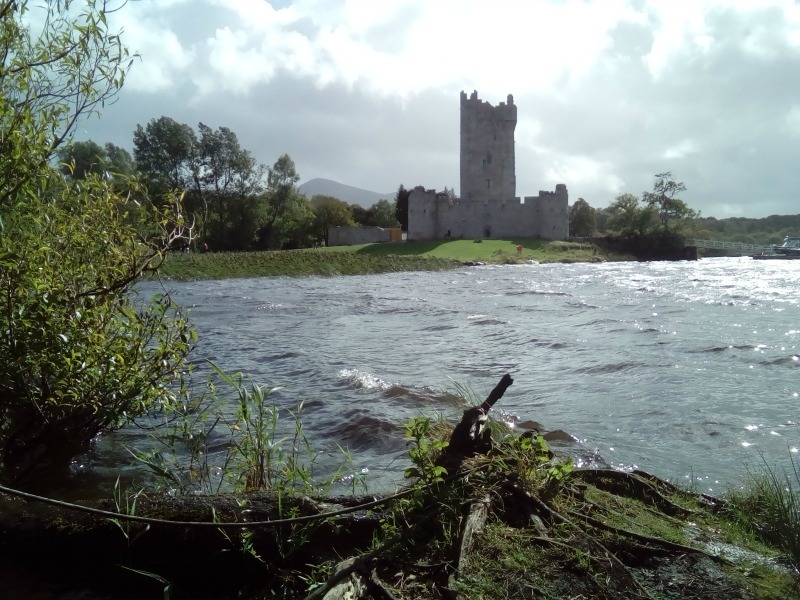 It’s a popular tourist route and takes in a whole host of attractions all the way around including castles, forts, beaches, heritage centres, cathedrals, islands, abbeys, and a national park. So much to see that it’s impossible to stop and visit everything in fact. In the summer there can be so many coaches and buses driving the Ring that it turns into a bit of a crawl but we hoped for quieter roads in September. 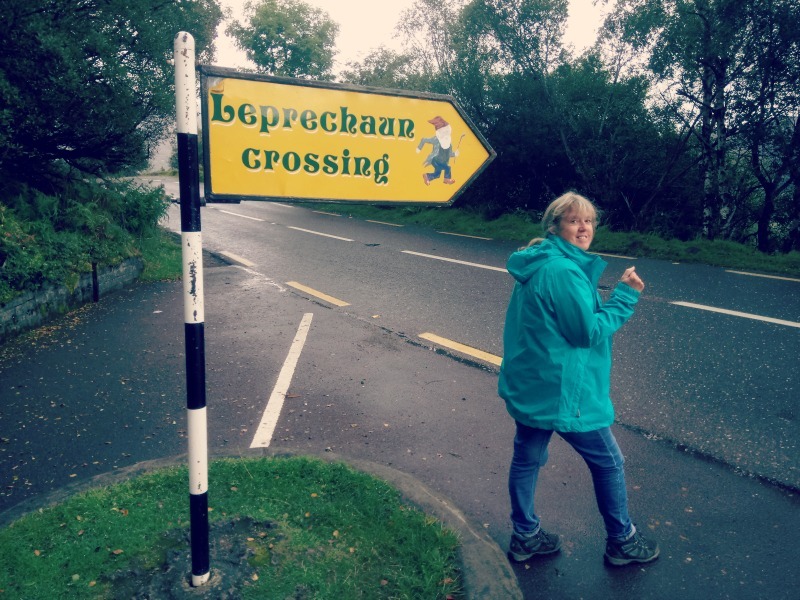 Brilliantly signposted all the way around it is one of Irelands biggest tourist attractions. 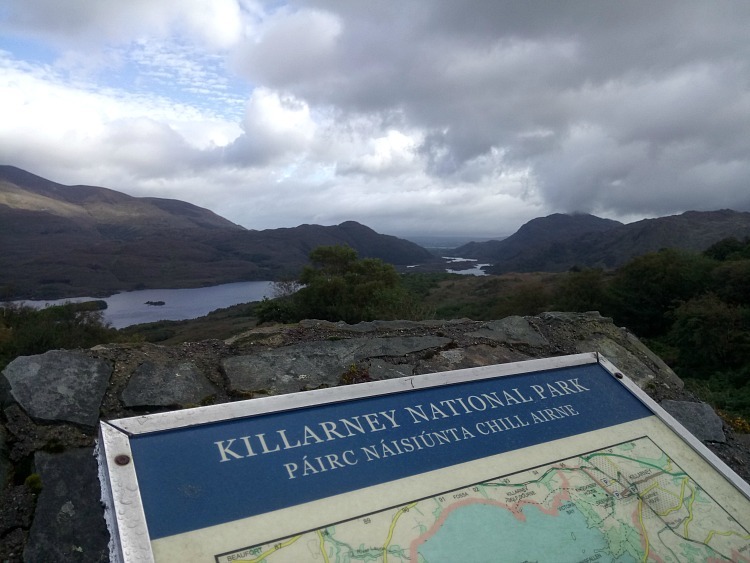 So an executive decision was made to go to Killarney National Park and explore the attractions which that had to offer. The Ring goes through the park so effectively we were just doing the nearest section. Heading out clockwise on the Ring of Kerry we set off for Molls Gap which is a high pass with views out over the fabulously named Macgillycuddys Reeks mountains and then pushed on to Ladies View which was apparently named after Queen Victorias Ladies-in-waiting.Sharp twisty turns and long sections only one car wide made it a great drive. The wind was getting stronger as Storm Aileen picked up strength so we headed back down in to the National Park. 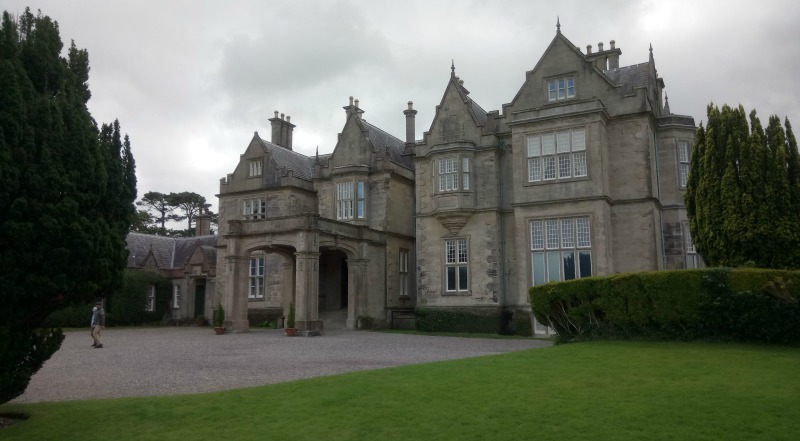 Visits to the Torc Waterfall, Muckross House, and Ross Castle filled the rest of the day as we walked miles through the national park and managed to avoid the worst of the rain and keep out of the heavy winds. 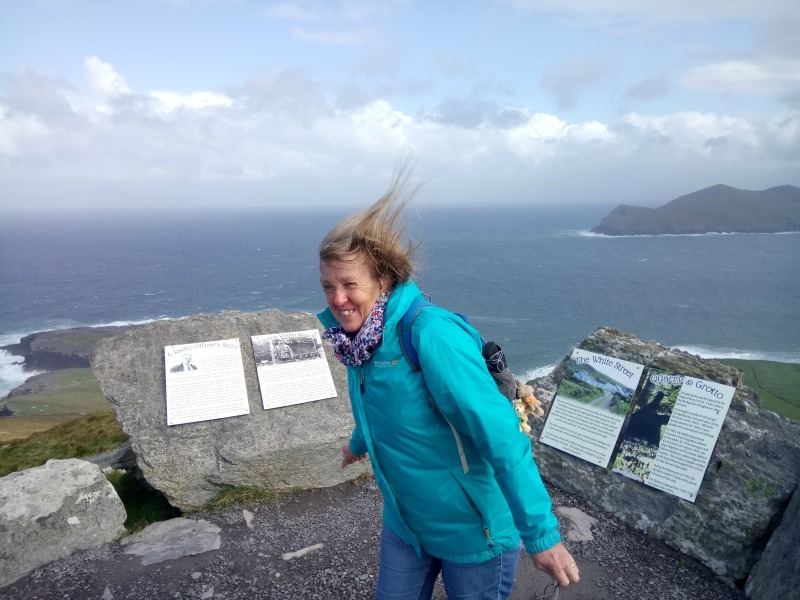 We were off to Cork the following day but decided to change our plans for the day and just go for it on the Ring of Kerry. The storm had abated slightly but the winds were still there but we just thought that we should have a go and see what happened. Good job we did as the roads were amazingly clear, most people had obviously checked the weather forecast and been sensible unlike us. 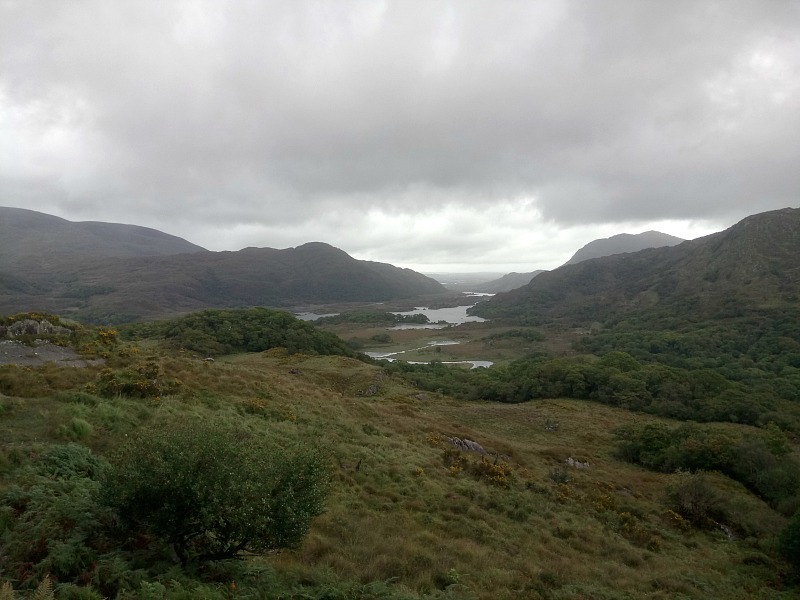 It was a lovely drive out through strangely named villages like Killorglin, Dooks, and Cahersiveen (who on earth thought of these names) as we headed for the furthest west point of the entire Ring. Not named after Valencia in Spain as so often reported but meaning ‘Island in the Mouth of the Sound’, Valentia is linked to the mainland by a single small bridge and is famous as the place where the first transatlatic telegraph cable was connected. We crossed through the town of Portmagee, across the O’Neill Memorial Bridge and headed up towards the Geokaun Mountain and Fogher Cliffs. Parking at the top we walked out onto the Atlantic coast and it was blowing a gale. I’m not sure I have ever known such strong winds and it was all we could do not to be blown over (or completely blown away in Jo’s case). Moving on around the coast, anti-clockwise, we stopped at the lovely Beach Cove Cafe in Waterville for some locally caught fish’n chips before experiencing a bizarre situation along the seafront. Lines of coaches and hoards of camera-waving tourists, mostly American, were crowding around a statue of Charlie Chaplin taking selfies and posing with the great man. No-one was at all interested in why there was a statue they just wanted photos. Apparently he just liked Waterville and went there on holiday! Strange eh. 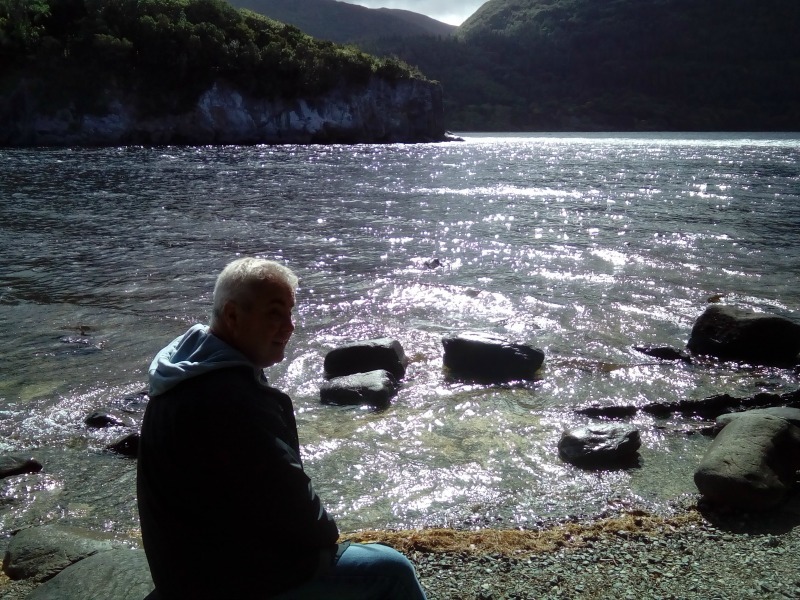 So in the end we actually did complete the Ring of Kerry drive before heading off South West towards our next stay in the city of Cork. It hadn’t been as busy or bumper to bumper as so many guidebooks claimed but I suppose we hadn’t visited in the height of the summer. It would undoubtedly been far more spectacular too if the weather had been better but this is Ireland after all. This is a fascinating post…thank you! 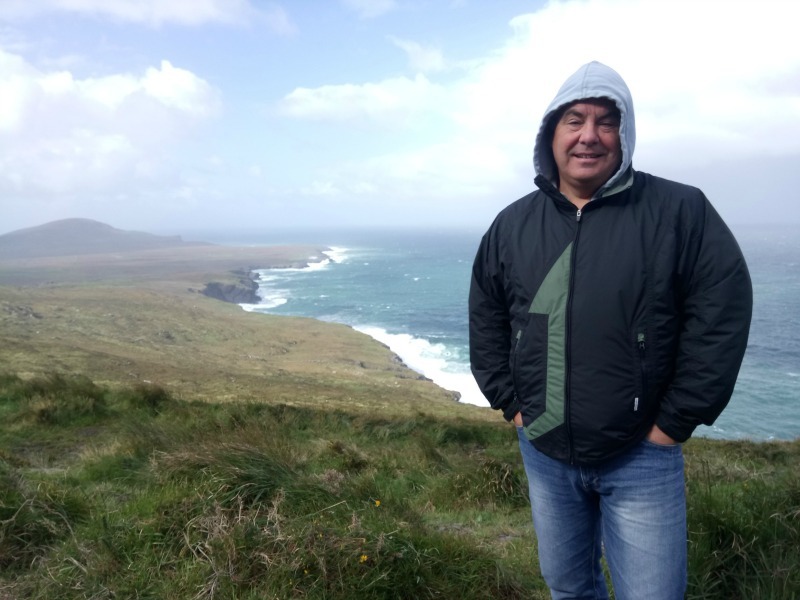 Thanks, the road trip around Ireland has been fantastic with so much to see so it’s fairly easy to write about. Biggest problem is only selecting a few photos from the hundreds taken! Thanks Dawn, I think its always blowy in Ireland. And a bit rainy. Ireland certainly looks a worthwhile place for another visit or two despite the weather. Thanks for sharing more information about Ireland I did not know. 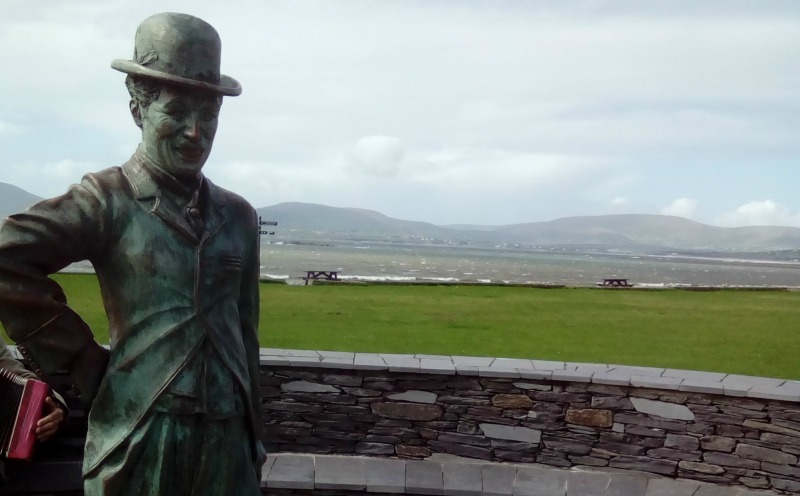 What’s even more questionable than the hordes of tourists viewing the statue, is that the community would erect one of Chaplin, there must be more Irish people to idolise? We thought the Chaplin statue was odd too. Just because he went there on a few holidays, very strange. 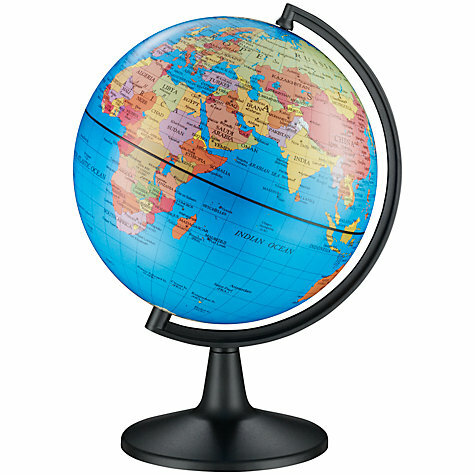 So many places to see here though. Is Portmagee related to Debbiemagee? I’m sure beautiful sunshine and calm days would be ideal but the weather you got is more authentic and makes the whole place look more moody and atmospheric. Need to get a tether for the Hobbit!